Honey Baked Ham is easy to make at home! This Honey Glazed Ham recipe is unbelievably juicy, bursting with flavor and boasts an intoxicating caramelized sugar coating. While it is not an exact copycat of the super popular Honey Baked Ham Store version, I dare say it is the BEST Honey Baked Ham you will ever taste – store bought OR homemade. To top it all off, this Honey Baked Ham costs a fraction of what you would spend at the HoneyBaked Ham Store – and you don’t have to worry about them running out of stock! This Honey Glazed Ham tastes gourmet but is super easy to make and will impress all of your Easter and Christmas guests! Remove ham from refrigerator and let sit at room temperature for 2-3 hours. Whisk together all of the Honey Glaze ingredients in a medium saucepan. Bring to a simmer, stirring often, until sugar dissolves and preserves melt, about 1-2 minutes. Set aside. Roll out 2 large pieces of foil to wrap your ham in, making sure they overlap in the center. Place ham on foil, flat side up (or on its side if it won’t lay face up), and brush ham all over with approximately 1/3 of the Glaze, including in between slices. Tightly wrap ham with foil and place ham FLAT/FACE SIDE DOWN on the roasting rack (or bottom of pan). Bake ham at 325 degrees F until the center registers 100-110 degrees F, (approx. 10-13 minutes per pound). 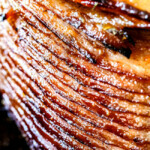 Remove ham from oven and increase oven temperature to 400 degrees F.
Carefully unwrap ham from foil and discard foil. Spoon juices from the bottom of the pan all over ham. Brush ham all over and in between slices with 1/3 Glaze (If Glaze has thickened, return to heat to loosen). Remove ham from oven and spoon juices from bottom of pan again all over ham and brush again with Glaze, including in between slices. Optional for sweeter, more caramelized exterior: Whisk together 1/2 cup granulated sugar and 1/2 cup brown sugar in a small bowl. When cool enough to handle, pat sugar all over exterior of ham. Return ham to oven and let broil, uncovered for 4-6 minutes, watching closely so the ham doesn’t burn. You may need to place foil on the top of the ham. Remove ham when the sugar is bubbly and caramelized. Loosely cover ham with foil. Let rest for 15 minutes before serving. Serve plain or husband loves it with a side of Dijon. See tons of side serving options above the recipe. Enjoy! *Yes, all the spices from the garlic powder to the paprika are 1/2 teaspoon. **Take care to insert thermometer into the thickest part of the meat without touching the bone. This temperature is safe as we are just heating the ham – it is already fully cooked. It is better to under “warm” your ham than to overcook it. Do not overcook your ham or it will be dry.